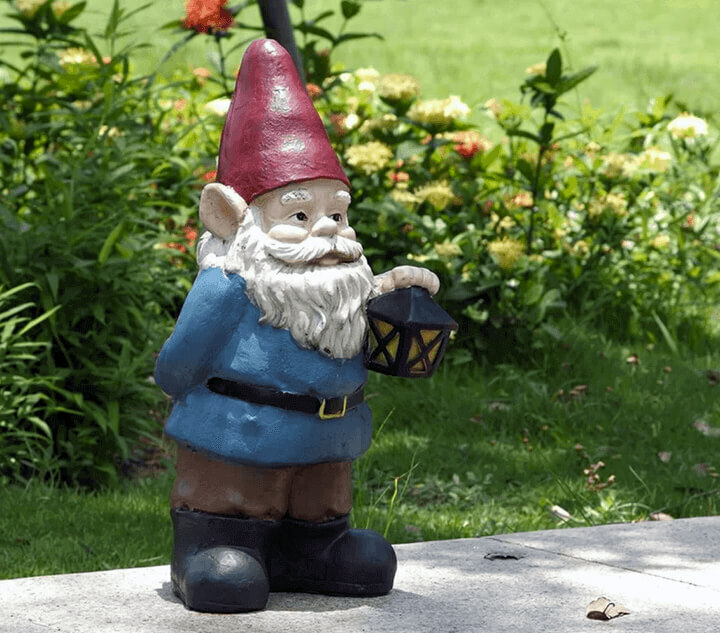 Garden gnomes have been around for a very long time. Since the middle of the 19th century, actually. Originally from a German sculptor, they soon gained in popularity and began appearing in gardens across the globe. Today, there is certainly no shortage. They can be found in just about any pose and form. Funny, cute, rebellious, and obnoxious tones are the currently trending types. 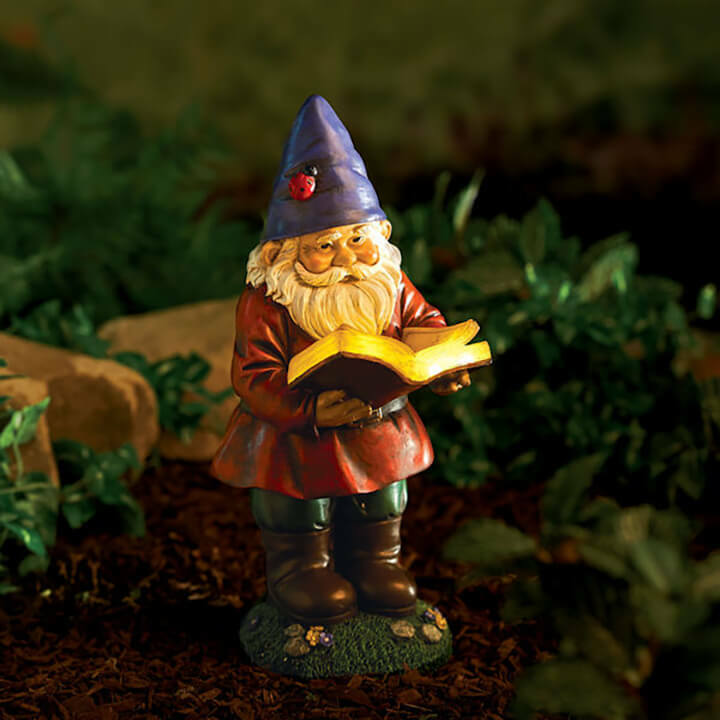 Gnomes can create a mystical appearance in your garden, and in some legends, gnomes are said to be magical. According to popular culture, the legend intertwined in these bearded little men is told that they protect the garden from evil forces, come alive at night and work tirelessly. 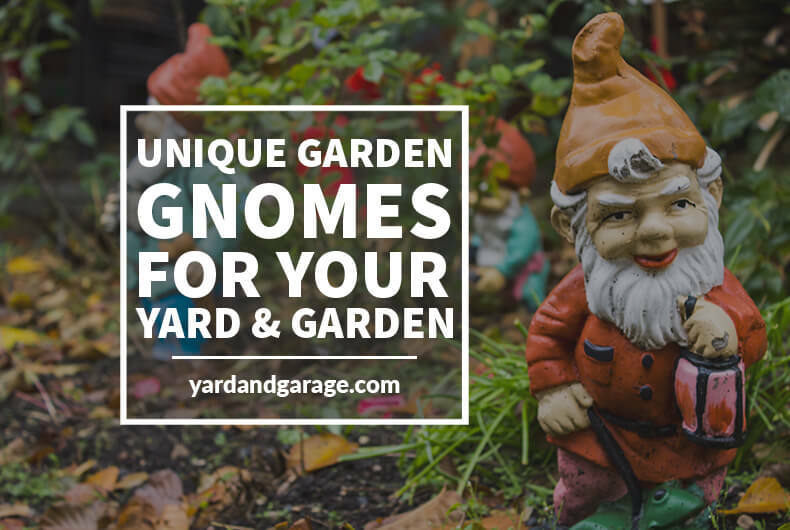 Let’s take a look at some adorable garden gnomes for sale for your garden or landscape. 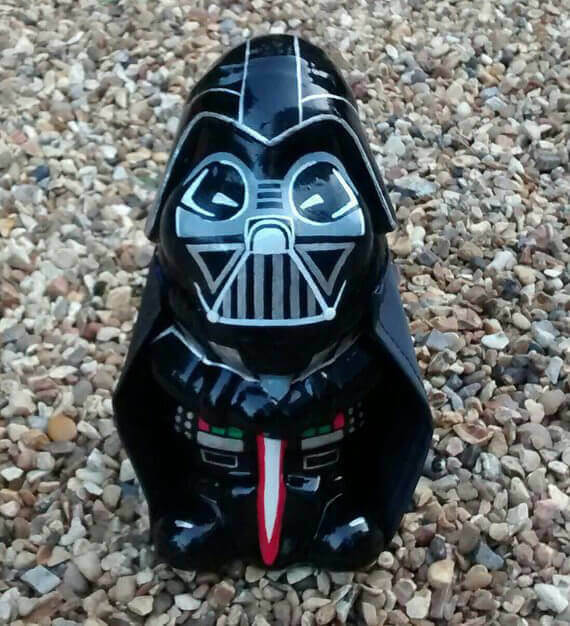 This awesome home-made Darth Vader gnome protects your garden with all the power of the force. Lightsaber drawn, Darth Vader gnome is prepared for anything, even you geeking out over him. The hand painting is very high quality and each piece is certainly unique. With a pointy gnome helmet and almost grinning helmet, you will add a touch of star wars to your garden. Send in reinforcements, because these naughty gnomes are in big trouble! They have teased poor kitty one time too many, and it looks like they are paying for it. Does anyone have any catnip handy? Look out because these two little charmers are off to the races! 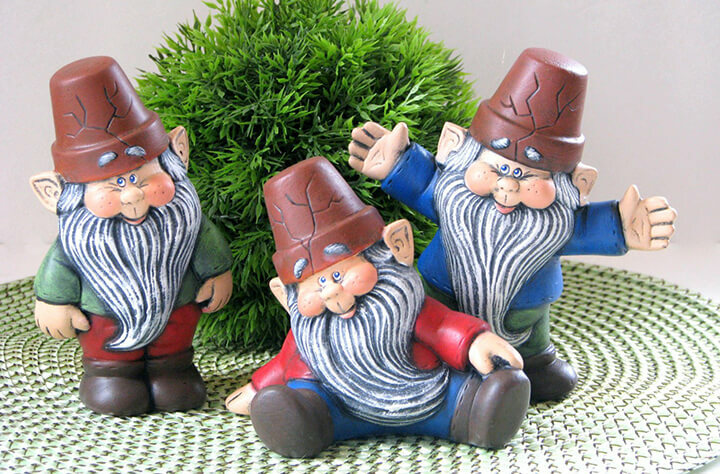 No matter which one comes out ahead, you will be the big winner with these cute gnomes greeting you each day. This wise old gnome will steal your heart. With a cute ladybug on his hat and kind wrinkles around his eyes, he will stand in your garden and add an air of peace and contentment. After being in the sun all day, he will be able to read by soft, glowing light at night. Anyone for a good bedtime story? 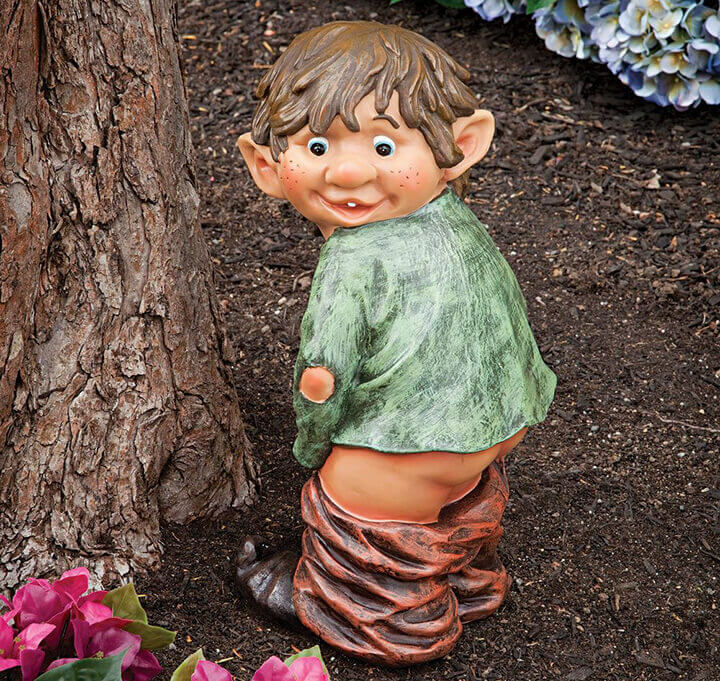 This gnome is “staying alive” to add a little disco fever to your lawn or garden (Amazon link). He has all the right moves to add a little cheer to your day, and that vintage suit and disco ball are sure to catch the eye of all the passersby. 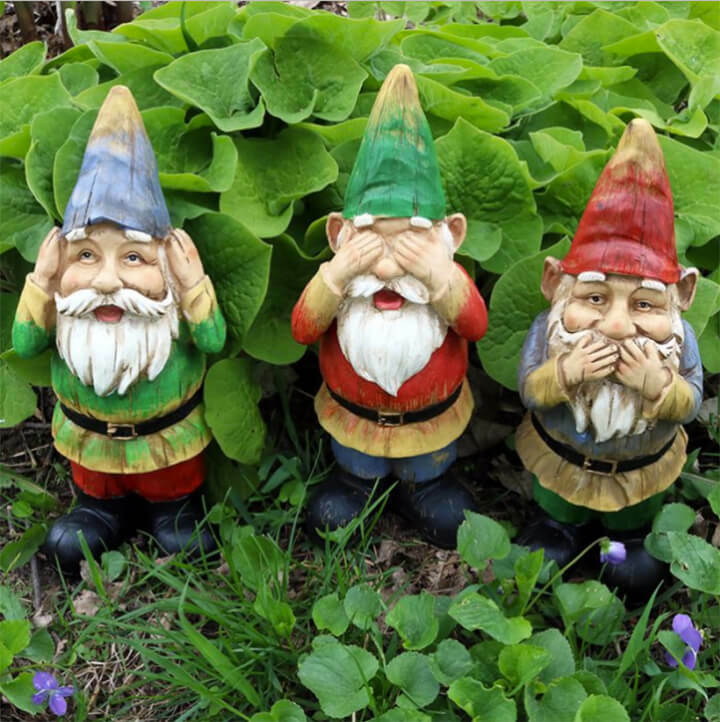 These three enlightened gnomes will be your daily reminder to stay on the straight and narrow path with their wise reminders to hear, speak, and see no evil. Their bright colors and appealing faces will make you smile every time you see them. This friendly fellow stays on the lookout for friends to greet from his playful tree house. His cheerful countenance and colorful hat will make even the most dreary day bright. He is great company for all the birds and squirrels, too! 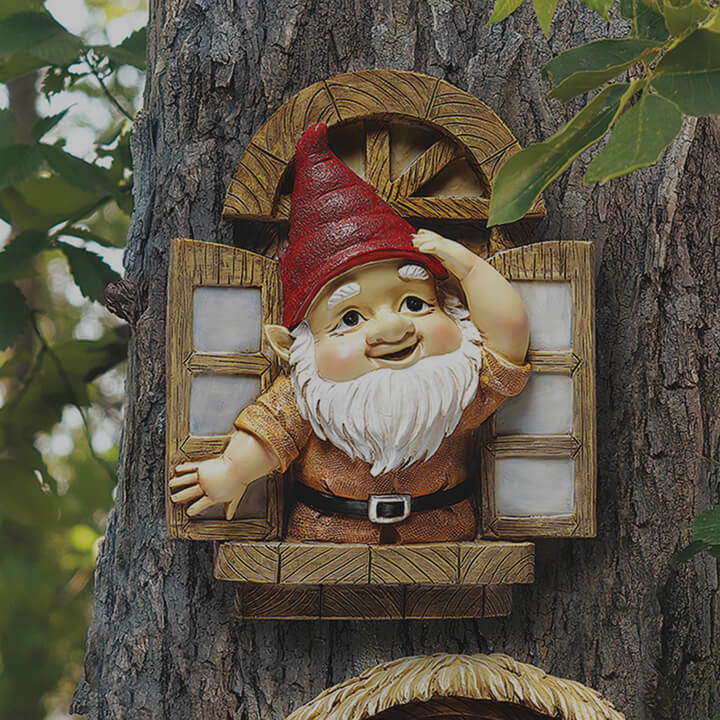 These two gnomes are trying to blend in (Amazon link), but they were made to stand out! Their winsome whimsy has even attracted some fellow forest creatures. With their sweet expressions and kind hearts, they will bring joy and forest magic to your garden, brightening the day of all who are lucky enough to meet up with them. Harley is happily lazing the day away in his adorable leaf hammock (Amazon link). He and his fine-feathered friend would love to hang out with you. No beating around the bush: these three funny little “crackpots” are the life of the party! They will be sure to win you and your guests over with their innocent expressions and cheerful attitudes. These gnomes just wanna have fun! This chubby little giver has fists full of gifts for you and your friends that will warm your heart! How can anyone resist his sweet personality and that little round nose? With his traditional red hat and those shiny black shoes peeking out from under his long white beard, he may cause cuteness overload! Loonie Moonie will make you blush first and giggle second. Dropping his drawers to show his fanny makes him a unique addition to the yard, and wil give your Sunday barbecue a conversation piece. What an embarrassing pose to freeze in, huh?! Loonie, put your Moonie AWAY! 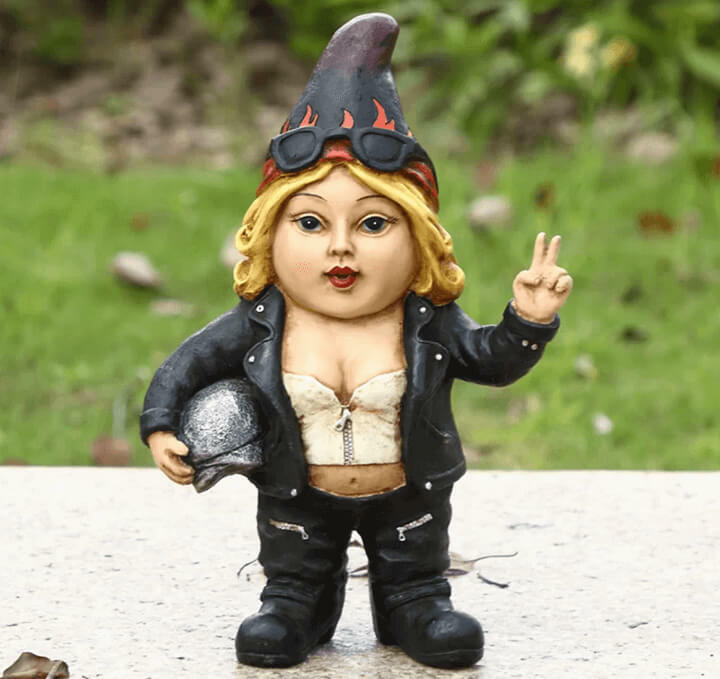 Creative additions such as this Biker Chick gnome adds a touch of rebellion and personal statement to your yard or garden. Don’t let her sweet face fool you, she’s one tough lady! If you listen closely, you will hear the tiny engine on her tiny Chopper fire up as soon as the lights go out! Pray This Guy Doesn’t Wake Up At Night! This legendary duo doesn’t have to have a tragic ending, added to your garden they can live in loving harmony forever. 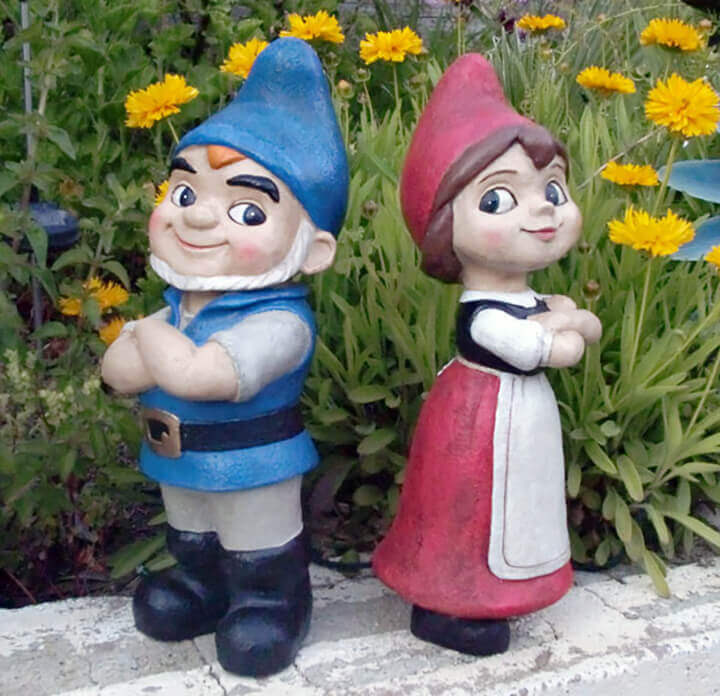 Gnomeo and Juliet are offered in a set of two, where they never have to be apart again. Adorable boy and girl set to protect your garden, because the best things come in pairs. For the other end of the sci-fi fans, this Star Trek red shirt gnome will make you die laughing. 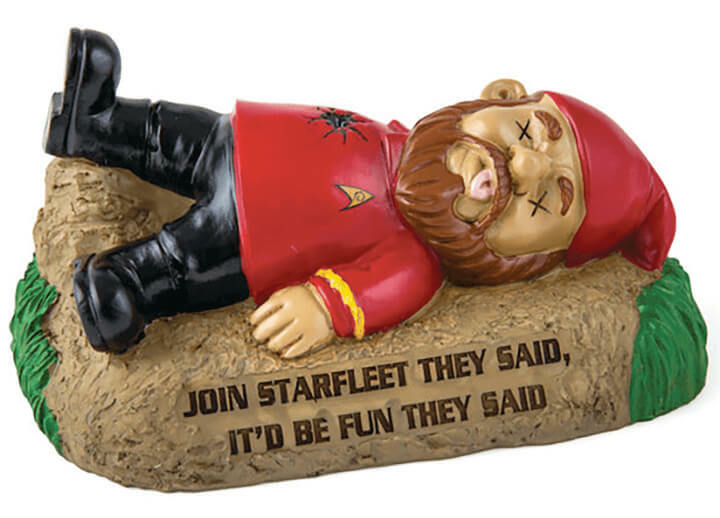 If you’re a fan of Star Trek, you will understand the humor of a dead redshirted gnome with the saying “Join Starfleet they said, it will be fun they said.” This gnome is sure to be a conversation starter and perhaps even convert a few people to Star Trek! At a staggering 8 feet tall, this guy will look over your garden quite literally. This guy won’t have much luck hiding, that’s for sure. 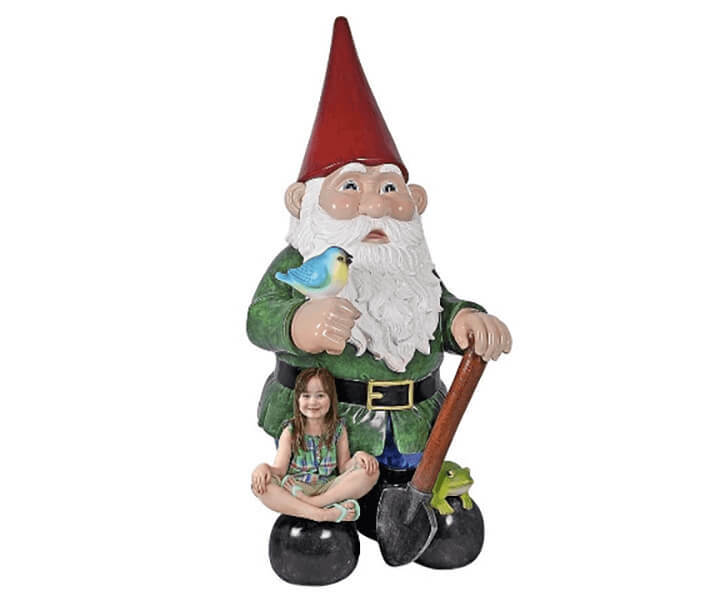 If you love gnomes, the Gottfried the Giant’s Bigger Brother Statue will definitely make a statement! Is there a Navy Sailor in your home? 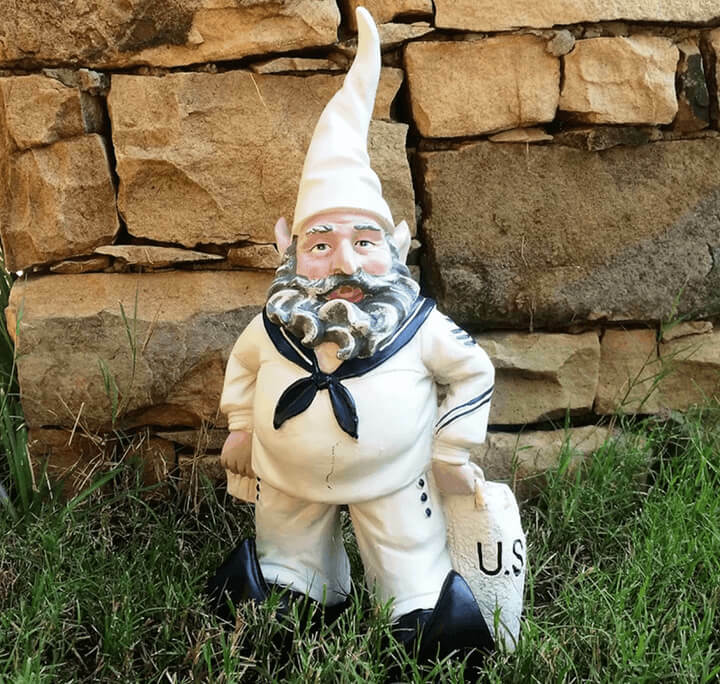 Surely they can appreciate the suit and duffel bag labeled US NAVY on this Navy Sailor Military Soldier gnome. Newly returned from ship, his sailing days are behind him. He is ready to be deployed into your awaiting garden to protect it in true soldier style. Or as I like to call it: Gardenzilla. 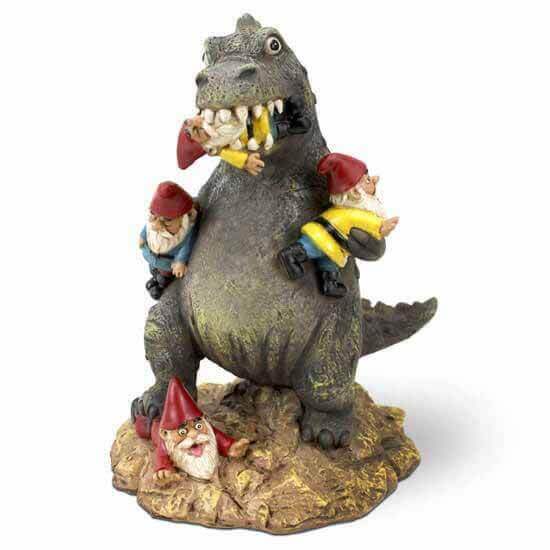 This gnome version of Godzilla makes a great addition to a Sci Fi garden. While Gardenzilla tramples on the four gnomes in its grasp, you may want to arm your other gnomes. Gardenzilla is sure to keep your garden safe from prowling animals and nosey neighbors. Fiona The Flower Fairy speaks volumes in her beauty and elegance. She will proudly grace your fairy gardens and be fondly gazing at your plants or flowers. Surround her with lovely flowers and she will bring you years of beauty and joy. 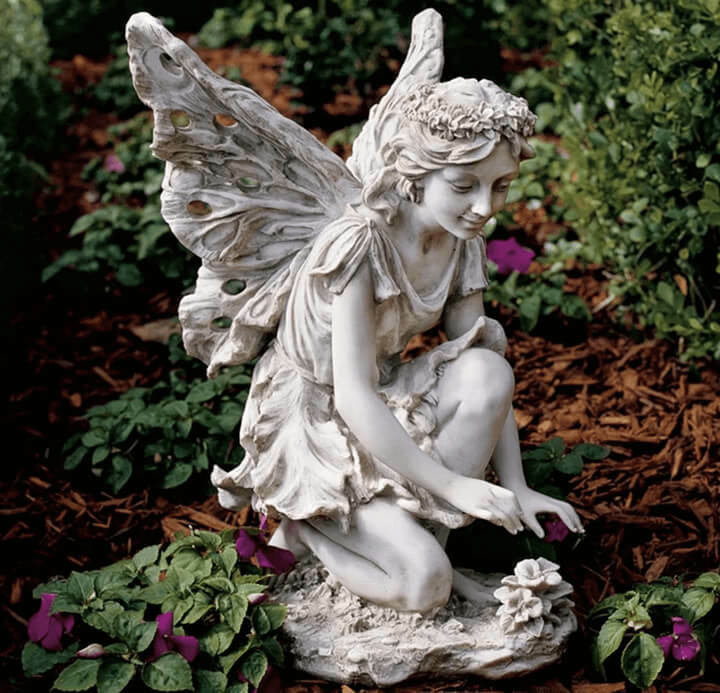 She wears an amazing dress, and full set of wings, bringing a fairy-tale into your garden decor. This young elf decided the tree needed watered, and was caught in the act! A unique conversation piece, his innocent goofy smile will warm your heart…Watch your toes! 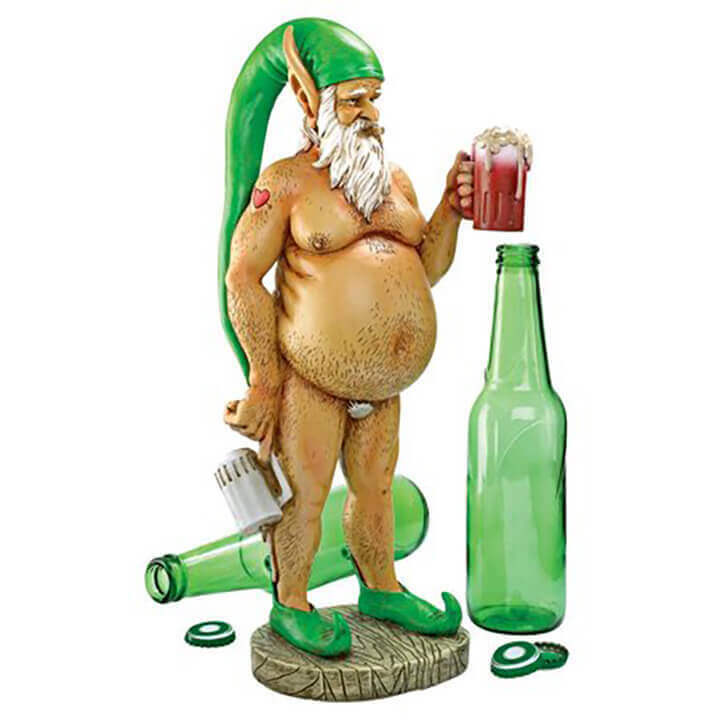 Appropriately named Surprised Garden Elf Statue, he can watch over your yard, patio, or even your sunroom with delight. 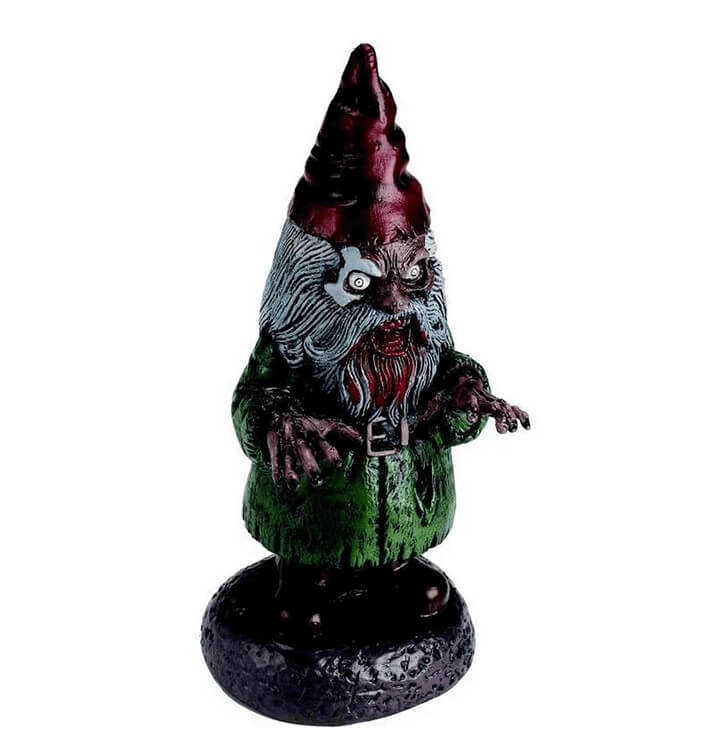 Military Garden Gnome With AK-47 (Amazon link) is a perfect pick for the gun lover in your home. 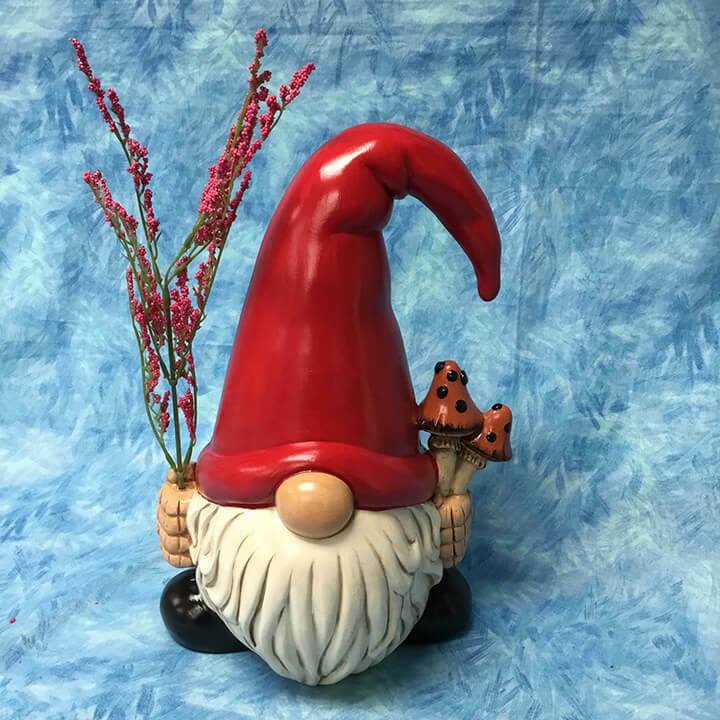 This gnome looks down his sight at something threatening the pansy’s! Garden protection in true Military Style! 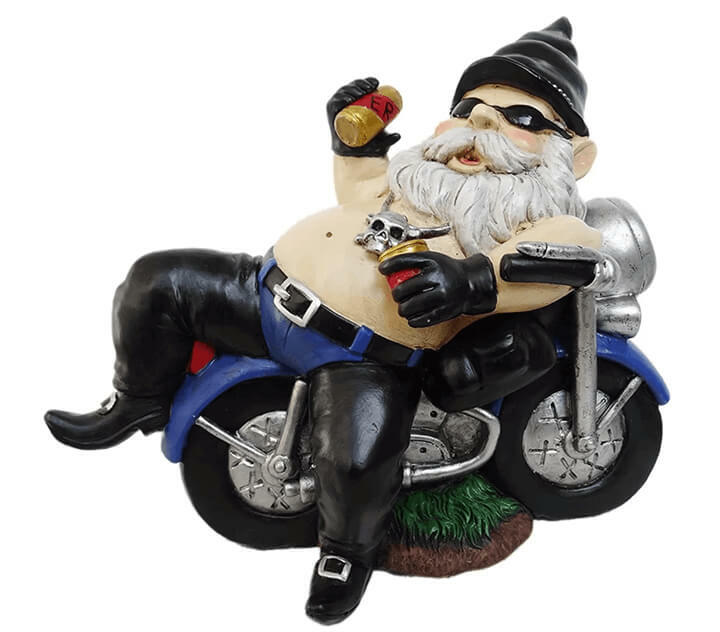 A great partner for the Biker Chick gnome, this Solar Biker Gnome Statue holds a torch that is powered by solar energy, while leaning on his bad-boy bike. Don’t mess with this guy, he is a tough cookie! Where Do Baby Gnomes Come From? 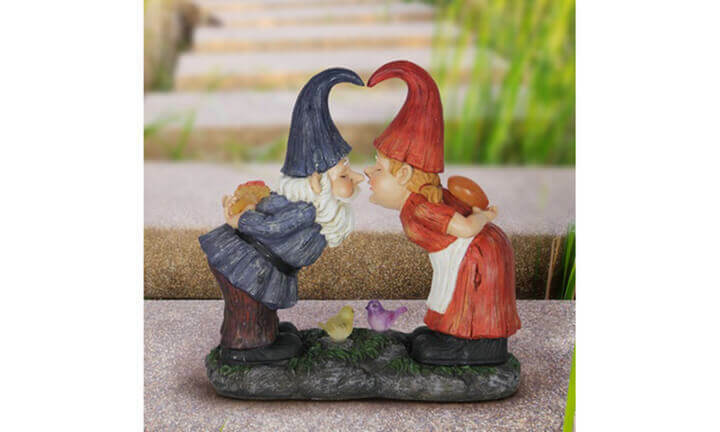 The Solar Kissing Gnome Statue tells a love story between two tiny little garden workers, who are sneaking a kiss under their solar lanterns. The lanterns are charged during the daylight hours, to light their paths at night. Perhaps one day a gnome wedding, and gnome baby! Two Gnomes Waiting For Way Too Long! 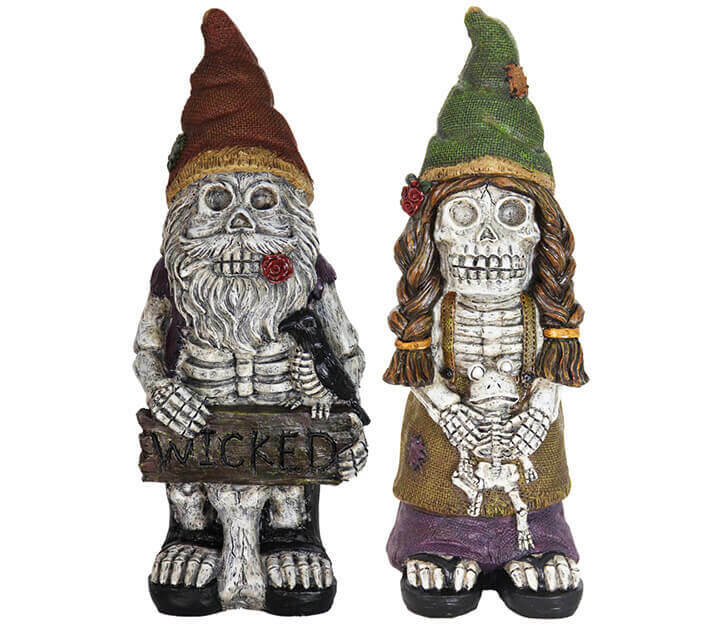 16″ Skeleton Gnome Couple have waited entirely too long, and are awaiting the home garden paradise they have been promised. Now frozen in skeletal form, they must perform their gnomely duties as skeletons. Wonderful addition for the skull lover in your life. Do you have a selfie king or queen in your home? The constant snapping of selfie images have taken the world by storm, and it seems everywhere you go, there is someone taking a picture of themselves. Selfie Sisters Garden Gnomes is a reflection of the popular activity, and a way to tease the selfie master in your household. Even if you do not smoke, you can appreciate the humor in this ‘happy’ Hippie Gnome (Amazon link). His “Keep On The Grass” hand held sign gives a dual meaning. Belly out with joint in his mouth, he is unphased and unapologetic. 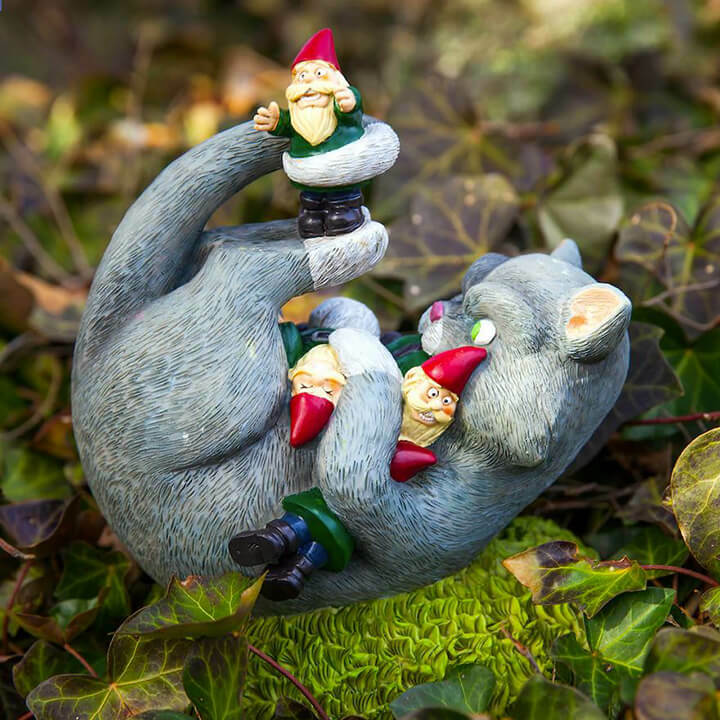 Humorous addition to any landscape or home. Nothing says summertime like a brand new bikini, does it? 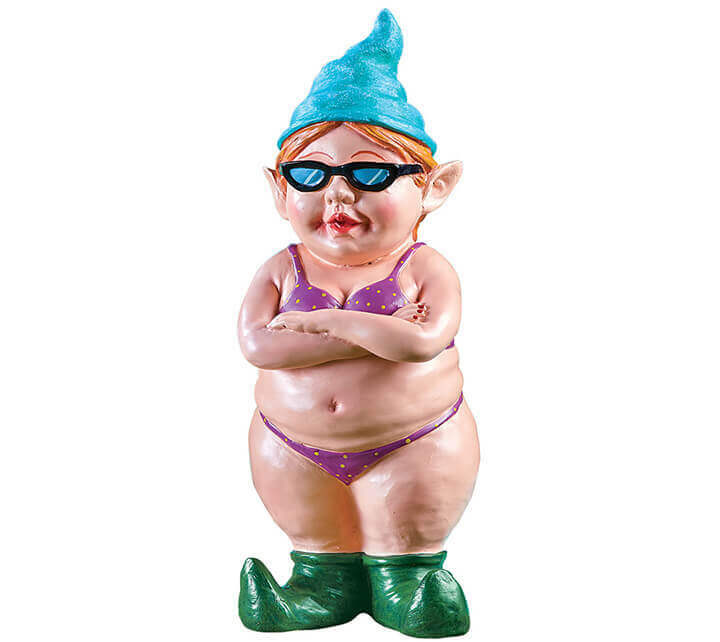 Well, almost nothing…This Bikini Babe Garden Gnome says fun in the sun with no shame to her game! She is sporting a string bikini, sunglasses, and her curled gnome shoes, ready for some beach sand and jet skis! This statue is a tribute to the famous actress Marilyn Monroe. Of course that name is probably copyrighted so this scuplture is titled Singer Party Gnome. It is reminiscent of the legend, and will make all of your other gnomes turn their heads to look. 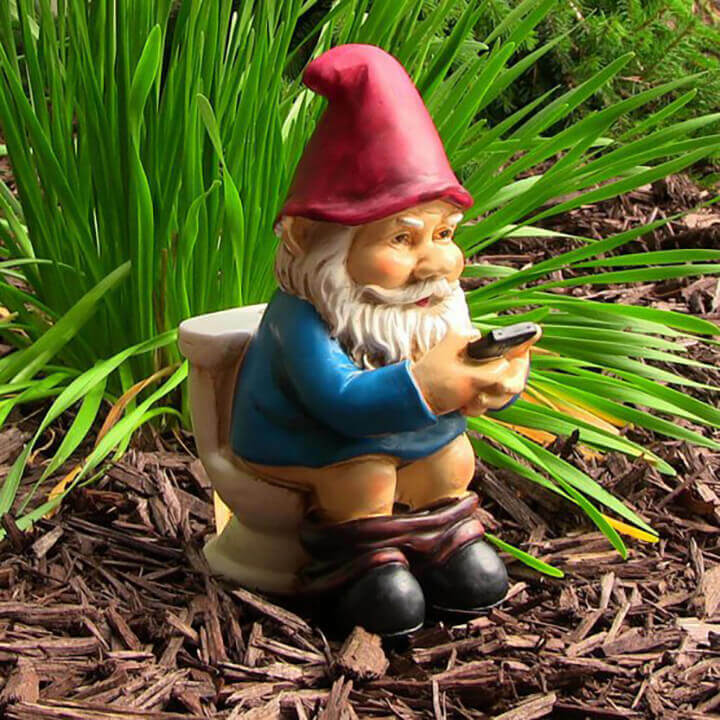 Doesn’t this Phone On The Throne garden gnome speak volumes about the current times? Everywhere you go people are on their phones, even on that throne! 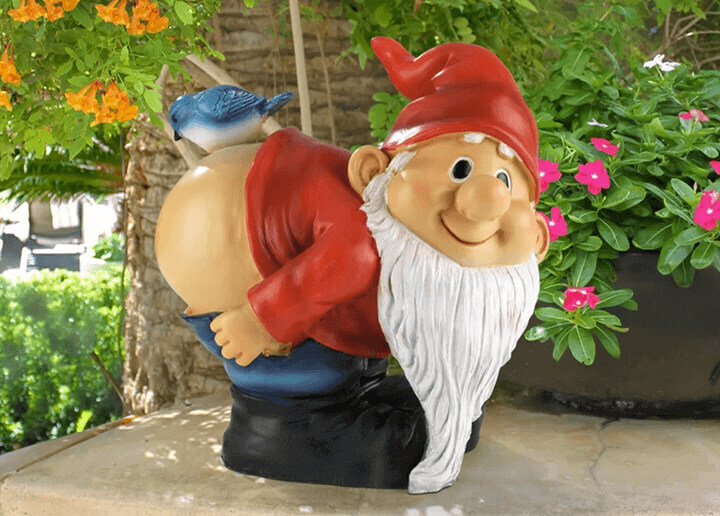 Humorous addition to the patio, yard or garden, and great conversation piece. 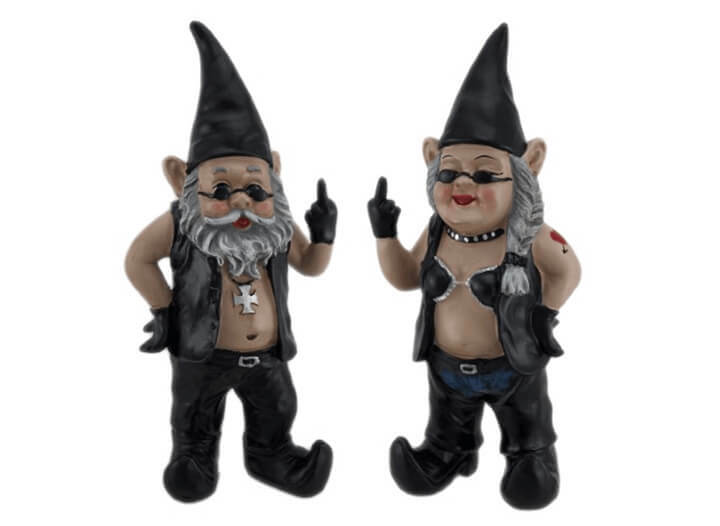 What a pair these two garden gnomes are!”Noschitt and Nofun” are two hilarious leather clad bikers awaiting their adventure, making sure to tell everyone they don’t care one bit.. These two are made for each other! What a wonderful memory, huh? The day you say “I Do”, I suspect it is no different for the mythical little men and little ladies. The faces on the pair are obviously happy…and terrified! 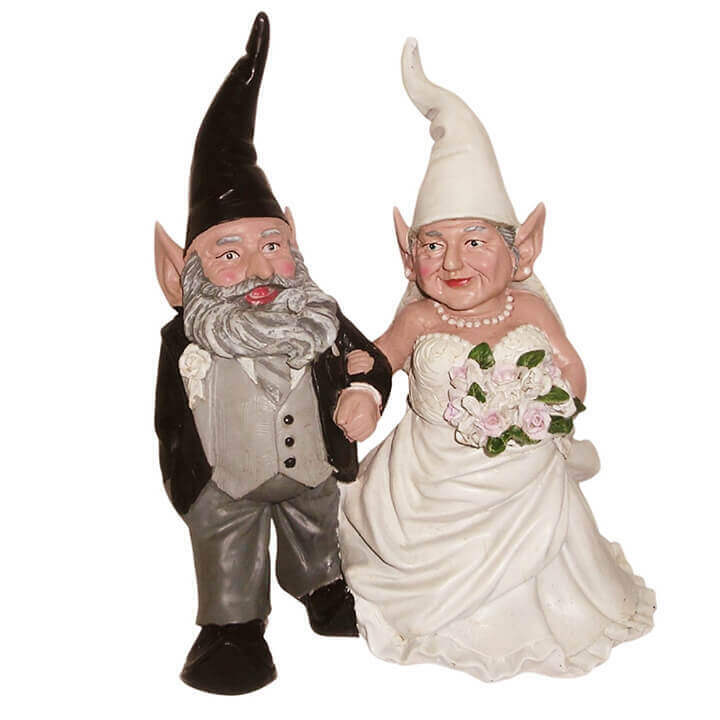 Bride and Groom Wedding Gnomes stand at 14″ and are fully dressed in formal wedding attire. 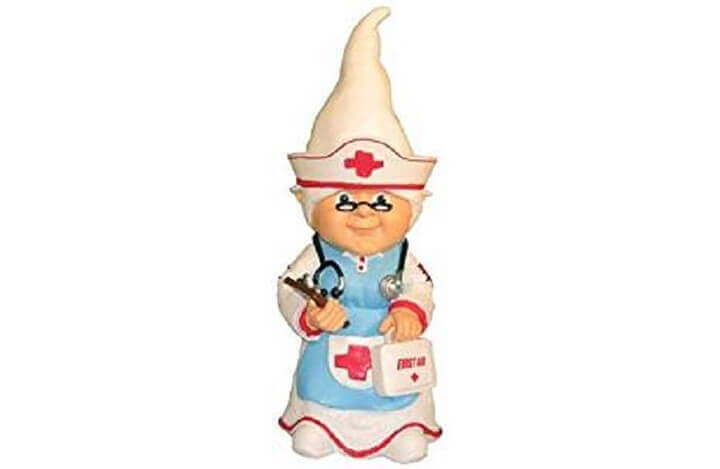 A great gift idea, Nurse Gnome will brighten the day of the medical professional in your life. Nurses don’t get enough recognition for their hard work and dedication, and this 11″ statue will remind them daily that they are appreciated. 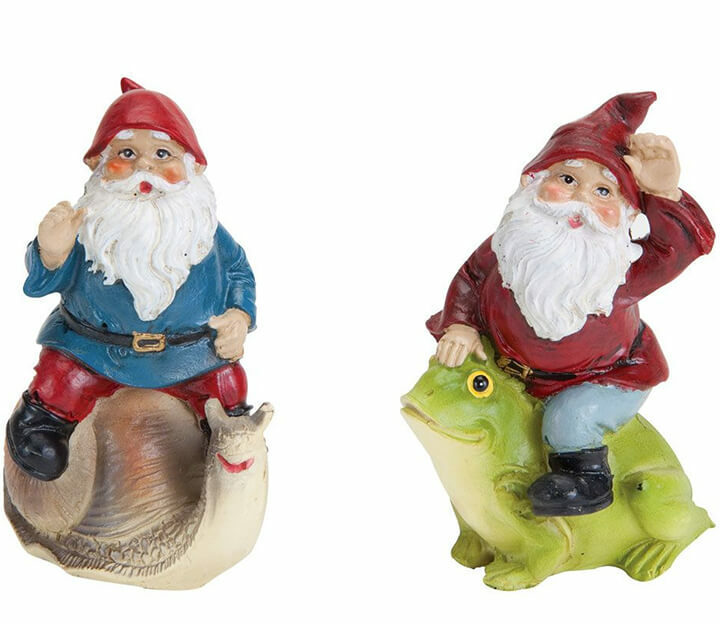 These last two aren’t related to gnomes at all but are still in the garden statuary family. They are so cool I just had to include them. 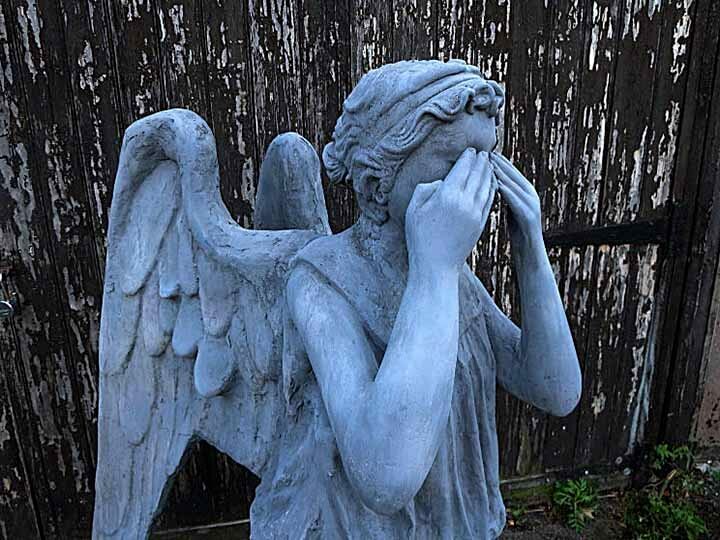 Nothing says sci-fi and creepy at the same time as this full-size garden weeping angel. While your neighbors might mistake you for religious, any doctor who fans will know to keep their eyes peeled as they walk past your house. I’m sure if you make a deal with the angel, it will zap away any intruding persons while you let it live in your garden. The invasion has begun in your garden! 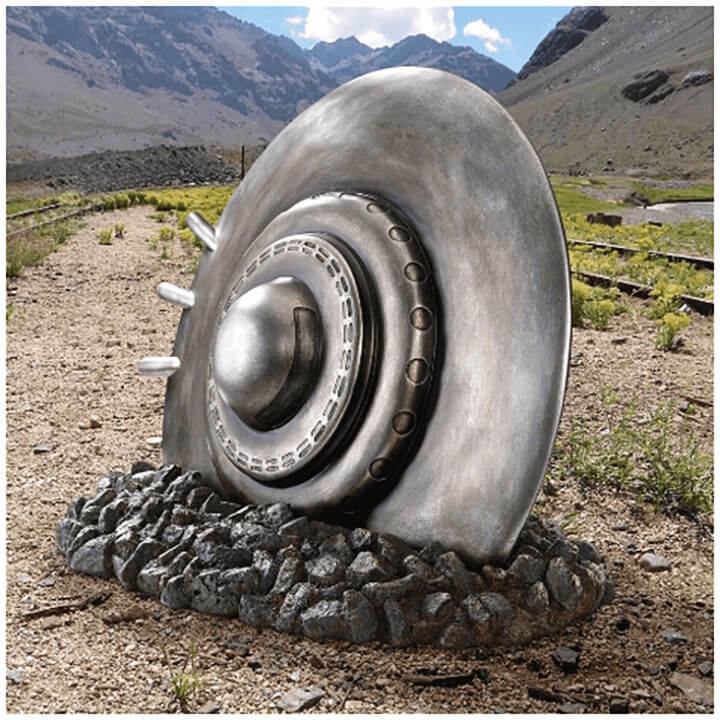 With this crash-landed flying saucer statue, you add the final sci-fi touch to your garden. This resin flying saucer will let you and your garden guests have the out-of-this-world experience you’ve always wanted.